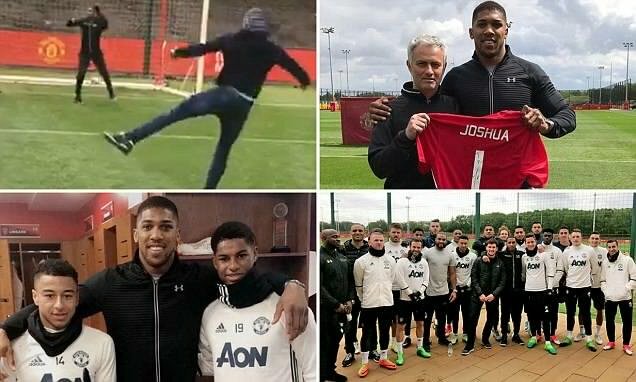 Heavyweight champion Anthony Joshua dropped in on Manchester United’s players ahead of their Premier League game at Tottenham on Sunday. Two weeks on from his memorable Wembley win over Wladimir Klitschko on April 29, the 27-year-old went live on Instagram to show himself training with United’s players at their Carrington base. The likes of Captain Wayne Rooney and England internationals Phil Jones and Jesse Lingard were visible in the video, which showed Joshua taking part in passing drills with the players. United boss Jose Mourinho, who has previously attended Joshua’s fights at the O2, then presented Joshua with a shirt carrying his name and the number one. The IBF and WBA champion also posed for pictures with members of the first-team squad. United have several high-profile fans, most notably Usain Bolt, while grime artist Stormzy recently visited a training session. The United squad appeared to be in high spirits during training on Saturday following their Europa League semi-final triumph over Celta Vigo. Following their European exertions, Mourinho has confirmed that United will play a changed team for all three of their final Premier League fixtures with the club eyeing Europa League glory. ‘I have to give some minutes to everyone because we have only 15 players, so I have to play them,’ he said. ‘But I have to play them mixed. I have to play them by periods. And I don’t have another solution. ‘In the Premier League we can only finish fifth or sixth, I think. I don’t think we can finish seventh and I don’t think we can finish fourth. So fifth or sixth.